A couple of little irritants don't stop us from giving Metaplugin a solid thumbs-up. Almost limitless chaining possibilities; great time-saver. Plug-in chainers are nothing new, but Metaplugin makes the concept easier than ever. Simply load it as an effect (Metaplugin) or instrument (Metaplugin Synth) into your DAW, then load as many plug-ins into it as your machine can handle, cabling them together (by dragging from one connection point to another) between the MIDI/audio inputs and audio outputs in whatever insane configuration takes your fancy. Even multiple instruments per instance are allowed, although there's currently no MIDI filtering built in, so they can only be triggered simultaneously by the one input. Every input and output (MIDI, audio and sidechain) of every plug-in shows up as a connection, and each connection can be hooked up to as many others as you like. So you can take separate outputs from multi-out instruments (or just the left and right channels of stereo ones) and send each one off to its own effects chain (with each channel of each effect heading off on its own subsequent journey), elaborately process sidechain signals, send MIDI to effects plug-ins, etc. Each module has its own wet/dry level, and a 2x oversampling mode is on board to minimise aliasing artifacts. 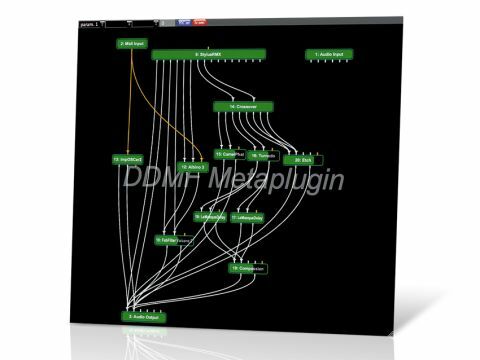 Also included are two 'helper' plug-ins for use specifically within Metaplugin. Crossover is a four-band crossover filter that enables you to split signals by frequency, with each band routed to a separate output (essentially enabling any plug‑in to work as part of a multiband processor). The second, MidSide, encodes and decodes mid/side signals, with each channel again sent to its own output. Logic users get the added benefit of VST plug‑in wrapping within their AU-only host, as the AU version of Metaplugin can host any combination of VST and AU plug-ins. A lot of this could potentially be done manually in many DAWs and other chainers, but it would take a huge amount of time and head-scratching, whereas Metaplugin makes it effortless. The only downsides were it crashing on us occasionally and the interface exhibiting odd behaviour at times.